SANAE IV (South Africa) built as a new base in 1997, an elevated base above a rocky outcrop replaced SANAE III 200km away that had become buried, the new base also has windows, a major psychological boon. Unlike just about any where else in the world, it is not really possible to build easily in Antarctica using naturally found materials (igloos aside which aren't permanent structures). There are no trees at all for instance and so no wood. Suitable rock is not readily found and even where it may be available, time is often of the essence meaning that building must be completed as soon as possible so that supply ships can leave before they are in danger of being frozen in. The builders themselves are often largely summer-only personnel who will leave with the ship. Winds and storms can upset building plans even in the relatively warmer and calmer summer months. 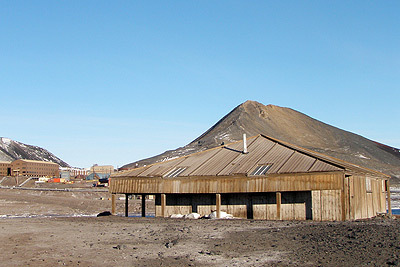 For these and other reasons particularly the cost of deploying personnel and paying them to build with natural materials compared to the cost of shipping-in building materials, Antarctic bases have almost all been made using materials that were taken in a pre-fabricated form and assembled on site. There have been some buildings in Antarctica that have had lower walls made of dry jointed local stone, they are small in size however and from a long time ago. These days local stone is not considered a useful or even viable building material as its use would result in environmental degradation. 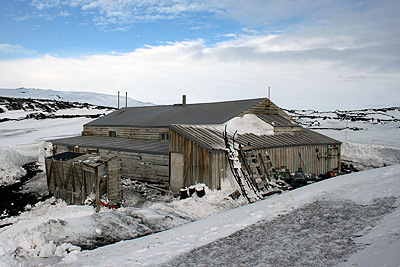 The first "bases" in Antarctica were the ships of the early explorers. They would stay on board and go ashore for visits to explore and perform scientific experiments. 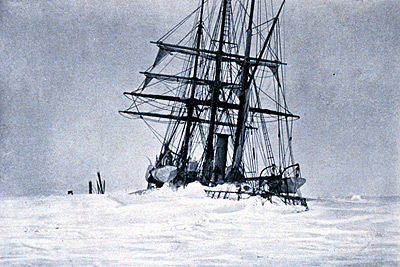 The first over-wintering in Antarctica took place in 1898 by the Belgica which had intended to return north before the winter started but became frozen into the ice, though it is unclear if the expedition leader Adrien de Gerlache may have intended this all along. 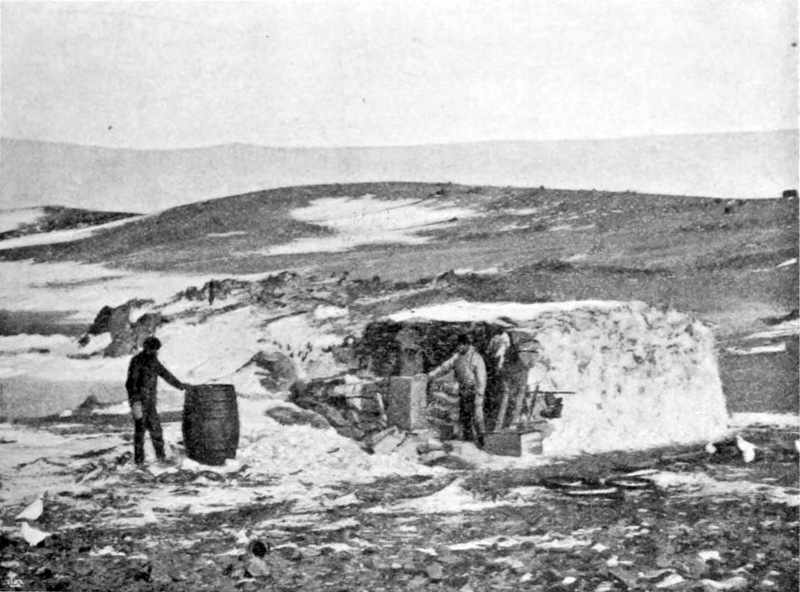 The first intentional over-wintering was the following year by Carsten E. Borschgrevink and his Southern Cross expedition in the winter of 1899 with 10 men and 75 sledge dogs. 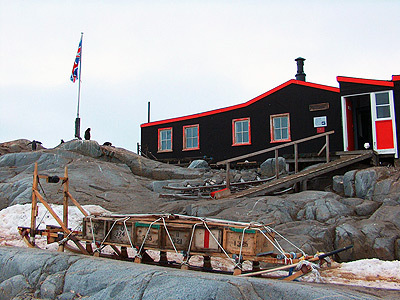 The base itself was made of pre-fabricated wooden huts (like wooden sheds but larger). The men were left in Antarctica by the ship and crew which returned for them the following summer. Many lessons were learnt the hard way with the early bases being cold and draughty. As insulation improved and draughts were banished, so damp inside the huts became a problem with condensation forming due to a lack of ventilation. There were also a number of near-misses from carbon monoxide poisoning again as a result of over zealous insulation and a lack of ventilation - and reliance on the direct burning of fuel within the hut for heating. 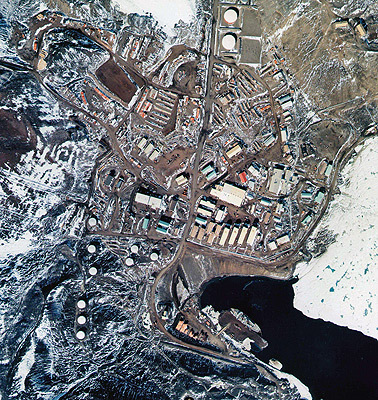 The first bases were only intended to be occupied for a short time, two summers and a winter, perhaps up to three years before being abandoned. Some were used by later expeditions, but as they had no maintenance since the original expedition left, the use was fortuitous and could not be guaranteed. They also often became buried in snow and ice which frequently had entered the building through windows that blew through in gales or doors that blew open. Another of the lessons to be learnt was that while the first buildings were placed directly on the ground, later ones should be raised above the ground. 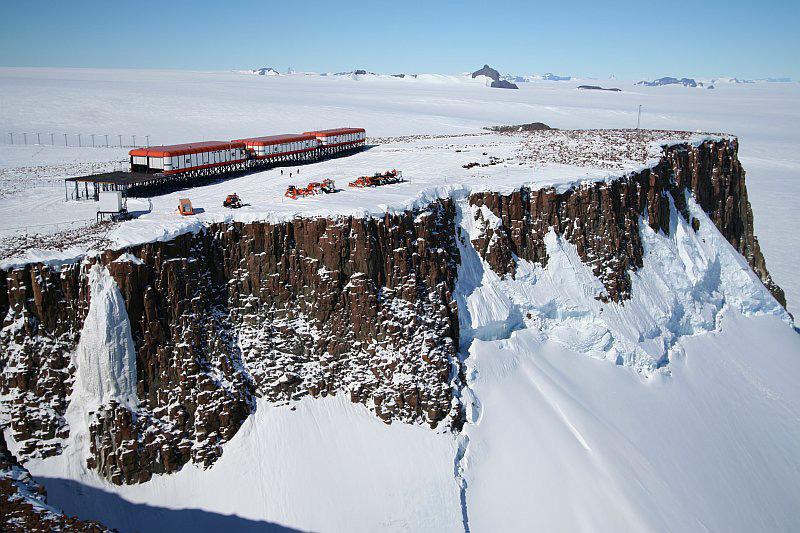 This was for a number of reasons, firstly many of the places where bases were built were on rock around the coastal regions of Antarctica, in these places the winter snow and ice would usually melt in the summer giving problems with melt water running towards the sea, possibly taking a short-cut through the building! Being in direct contact with the ground also led to the formation of wind scoops, tails etc. of snow whereby the shape of the building and orientation into the wind leads to blown snow being deposited around the building. This can block doors and windows, make it difficult to move around outside the building as hard snow is deposited on thoroughfares and buries outside stores that may be needed during the winter. Building on piles or supports of some kind means that melt water can easily run under the buildings and the wind can also blow underneath so reducing the likelihood of snow being deposited in places that may cause problems. For many sites, where bases are built, this is as specialised as things need to get. Materials have developed over the years and ancillary buildings built that don't all need to be heated as much as the accommodation buildings instead of the single multi-purpose hut. In particular the realization of the threat of fire has led to multi-building bases with gaps between the buildings to avoid the spread of fire should it occur. Many bases have grown over the years into a mish-mash of disparate structures that look like rather brightly coloured industrial areas. Architecture and sympathy with the environment have taken a poor back-seat to functionality and convenience particularly when accompanied with the additions of other units over the years in an ad-hoc fashion. More recent bases however are being designed as coherent units some with even some style and elegance to them that could certainly not be applied to the haphazard way that other bases have grown over the years.